While physicians as a whole slowly adopt new technology, such as implementation of electronic medical records, a new wave of clinicians look toward clinical research and doctor involvement to bring digital technologies into the GI practice to help clinicians improve patients’ experiences, sources told Healio Gastroenterology. Up to this point, electronic health technologies have been developed without the insight of physicians, Chey explained. “Doctors have to become increasingly involved in the development of these e-solutions and apps,” Chey said. With current movements in health care changing how doctors are paid and how patients are managed, experts discussed an impending increase in the use of digital health technologies within the next few years. “The health care system is starting to look more and more like managed care,” explained Brennan M. Spiegel, MD, MSHS, AGAF, FACG, director of health services research in academic affairs and clinical transformation at Cedars-Sinai Health System. Gastroenterology is often considered a field that is already driven by technology. The use of a variety of technologies, such as wearable biosensors, apps, social media, conferencing and telemedicine, will allow health care providers to monitor and manage populations in real time, Spiegel explained. Spiegel believes there is a new physician emerging — the digitalist — who will incorporate such technologies in the GI practice for the benefit of both the health care provider’s practice and the patient. Along with physicians specializing in digital communication, apps that undergo clinical testing before use, as well as follow-up quality testing, may allow them to play a larger role in the management of chronically ill patients with GI diseases and syndromes. According to Spiegel and Chey, a digitalist is a type of health care provider using digital technologies to reach out from a central location to physicians and patients. The digital technologies used — including wearable biosensors, mobile health apps, social media, telemedicine and others — would focus on patient-physician communication outside the traditional in-office provider visit. “This doctor doesn’t quite exist yet,” Spiegel said. “It is starting to form, and I predict that within 3 to 5 years, we will be hearing about digitalists, or doctors like digitalists, much more frequently,” Spiegel told Healio Gastroenterology. “At a training level in medical school, there should be career pathways that focus on technology,” Chey also said in Hawaii. “It is not clear whether every doctor will be a digitalist or if there will be dedicated doctors who focus primarily in this capacity. Time will tell,” Chey told Healio Gastroenterology. Spiegel is also the director of a group at Cedars-Sinai called Cedars-Sinai Center for Outcomes Research and Education (CS-CORE). “In addition to its focus on traditional health services research techniques, the Center is also developing new technological innovations to expand care outside of the provider visit, including use of patient-provider electronic portals to support clinical decision making in electronic health records,” according to the CS-CORE website. Spiegel said new technologies will not replace the work of the health care provider. “We need doctors more than ever because the technology is allowing the doctor to do what they do best, which is to be a human being and look at another human being and understand what is happening in his or her life. We need doctors to look at the patient’s eyes and look at the patient’s body and understand nonverbal cues. Computers can’t do that and never will,” Spiegel said. Many challenges exist in the development of an app that adds value to both the patient and health care provider. Thousands of health-related apps exist — currently more than 100,000 some estimates say — but few have been tested to verify any advertised benefits. Spiegel shared an anecdotal example from hepatology that stresses the importance of clinical research in the development and testing of apps. Studies have shown that this app can diagnose the problem, Spiegel explained. Another app that has become available and clinically tested is My GI Health, which was developed by Spiegel and colleagues at Cedars-Sinai. 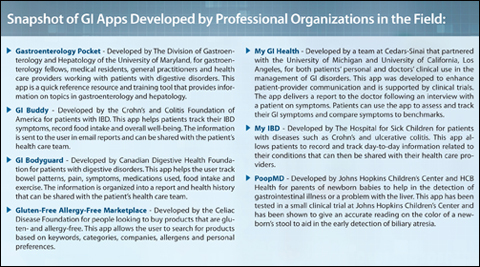 My GI Health is an app that interviews users about GI symptoms and delivers a report to the doctor. Patients can use the app to assess and track their GI symptoms. The app also helps the patient compare symptoms to benchmarks and learn more about any symptoms they experience. Yet, the ability of a computer algorithm to take patient history has been shown to excel compared to a health care provider’s ability to do the same task in clinical trials, and the same has been shown with the My GI Health app, which took 4 years to develop, Spiegel said. A study performed by Christopher V. Almario, MD, division of gastroenterology at Cedars-Sinai Medical Center, and colleagues showed that history of present illness reports were of higher quality overall when generated by a computer compared with history of present illness patient reports written by physicians during usual care visits in a clinic. The researchers, who published the report in the American Journal of Gastroenterology, also said the computer-generated reports were better organized, more succinct, more comprehensible, more complete and more useful. When it comes to patients, the digital divide still plays a big role. Almario CV. Am J Gastroenterol. 2014;doi:10.1038/ajg.2014.356. Bajaj JS. Clin Gastroenterol Hepatol. 2015;doi:10.1016/j.cgh.2014.05.011. Spiegel BMR. How Information Technology Will Transform Gastroenterology. Presented at: ACG; Oct. 16-21, 2015; Honolulu. William D. Chey, MD, can be reached at University of Michigan Health System, Division of Gastroenterology, Taubman Center, Floor 3, Reception D, 1500 E. Medical Center Drive, Ann Arbor, MI, 48109; email: wchey@umich.edu. Brennan M. Spiegel, MD, MSHS, AGAF, FACG, can be reached at Cedars-Sinai Health System, Clinical Office, 8723 W. Alden Drive, Steven Spielberg Building, Los Angeles, CA, 90048; email: Brennan.Spiegel@cshs.org. Disclosures: Chey reports he is a principal in My Total Health. Spiegel reports receiving research grants from Amgen, AstraZeneca, Ironwood Pharmaceuticals, Nestlé Health Science, Shire and Takeda; serving as an advisor for Allergan, Commonwealth Labs, Ironwood Pharmaceuticals, Millennium Pharmaceuticals, Takeda and Valeant; and holding royalties, patents or ownership interest in AbStats, My GI Health and My Total Health.